On June 16th, Dr. Wardynski tried rewriting history proving yet again that Orwell understood power, its corrupting influence, and its object once again. 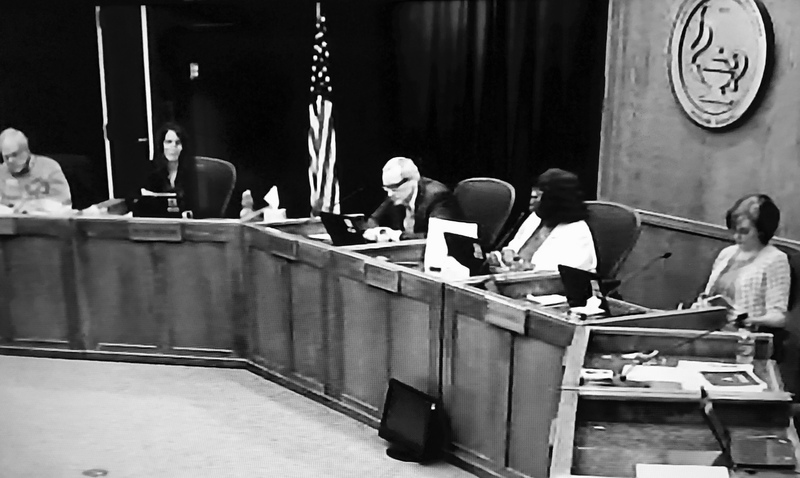 Thankfully, despite his authoritarian control of the Huntsville City Schools Board of Education, and his control of the teachers of our schools, Dr. Wardynski does not control history nor those who record it. Mercer: Several years ago, we were in the position related to the budget and related to the general fund having enough, uh, a large enough balance out there, and uh, so that’s the things that we’re looking for. Obviously, it’s turned itself around, and uh, as far as our financial statements are concerned. We don’t have any issues we would bring to your attention associated with that. So we feel comfortable with the financial position even in light of, the uh, change that was related to the pension plan. Wardynski: Um, you said the financial situation turned around? Wardynski: You said that the financial situation had turned around? Mercer: Yes from several years ago. Wardynski: There’s a fellow that puts himself out as an expert on the school system, on a blog. Wardynski: He asserts that the school system was not in financial difficulty. And any difficulty it had was already well under correction in 2011-12. Is that the case? My recollection is that the state had taken over pretty much by 2011-12. Mercer: I was fixin’ to say, he would be in disagreement with the state because the state did have people in here who were working and trained to make sure that things were done appropriately to change the budget so that you would have adequate coverage for at least one month of expenses, and you were well under one month of expenses by that time. Wardynski: Would that have fixed itself, or would that have taken leadership action to fix that? Mercer: I would suppose that it definitely took leadership action. I definitely took being able to for, to have better information to forecast budgets into the future, to make plans for those budgets, and to make plans for spending related to those budgets. So, no it could not have happened on its own. In order to ensure that I am quoting Dr. Wardynski accurately, you may view the exchange below. Good use of his time and effort, no? Taylor: In short, just to comment on the general fund and the debt service fund, we typically look to those funds, to um, to assess the the general financial posture, the general net position of, of our district’s financial strength. Um, those are the two funds over which you all exercise discretion in your expenditures. So on the bottom line of those two funds, I’m sorry, shown here and here you’ll see the net, or the gross, is about forty million dollars. It’s flat with where we ended last year. We do have a balanced budget this year, and I’ll show that in a subsequent slide. Wardynski: So, our net position is forty million to the good. Wardynski: And when we got her our net position was? Wardynski: Negative 20 million. So no withstanding the blogger who doesn’t understand finance, our district was in deep financial difficulty. And um, in a period of five years, we’ve reversed that, rebuilt a quarter of the school system, undertaken a digital initiative, increased stipends for teachers, and gotten a forty million dollar position of, uh, strength. You may view this exchange below as well. I believe that I have acknowledged the financial difficulty that our schools were in in 2011, but in case that isn’t enough, if you go back to March 2011, you’ll find that I began writing about the cuts that Special Education was facing even then. That was, by the way, four months before Dr. Wardynski was hired on July 5, 2011. What I claimed is that the district was out of debt before Dr. Wardynski arrived. If you will read below, I’ll be happy to share with you my evidence for making that claim. This plan was not considered sufficient to the state, so either the state sent Dr. Ed Richardson to the district or the board hired Dr. Richardson. 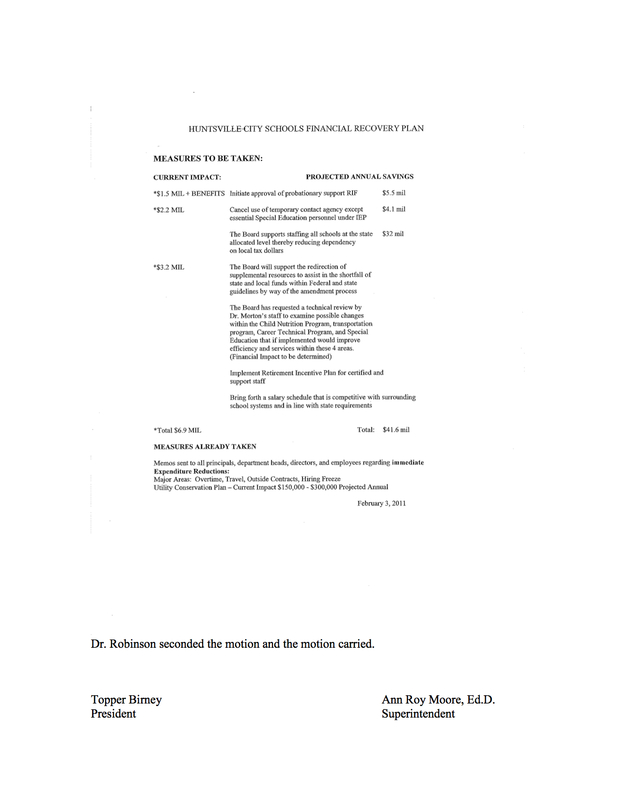 On February 3, 2011, the Huntsville City Board of Education authorized board president Topper Birney to negotiate with Richardson to “advise the city school board on ways to cut spending and jobs to recover from a $20 million deficit,” according to Challen Stephens of the Huntsville Times. Again, this occurred five months before Dr. Wardynski was hired on July 5, 2011. 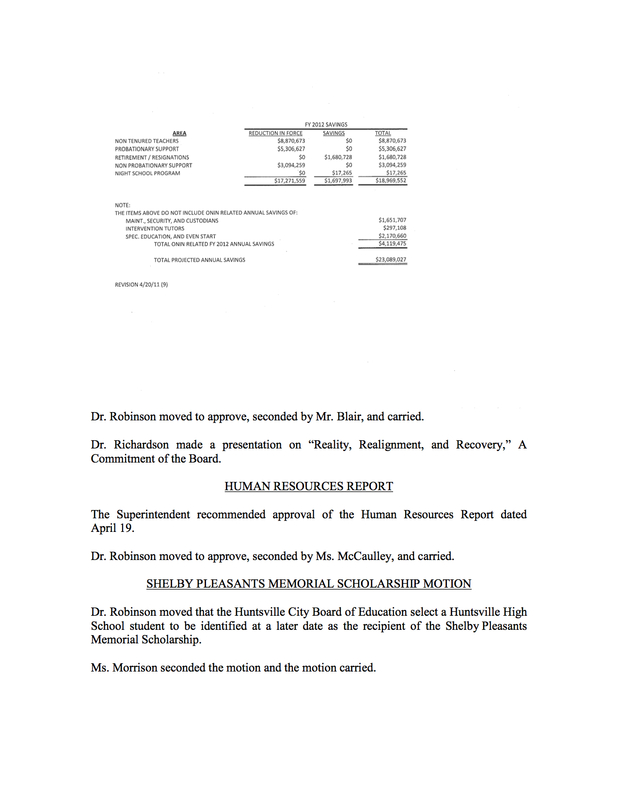 From February to June of 2011, Dr. Richardson was paid $41,687 (at a rate of $600/day) to help get the district out of debt. 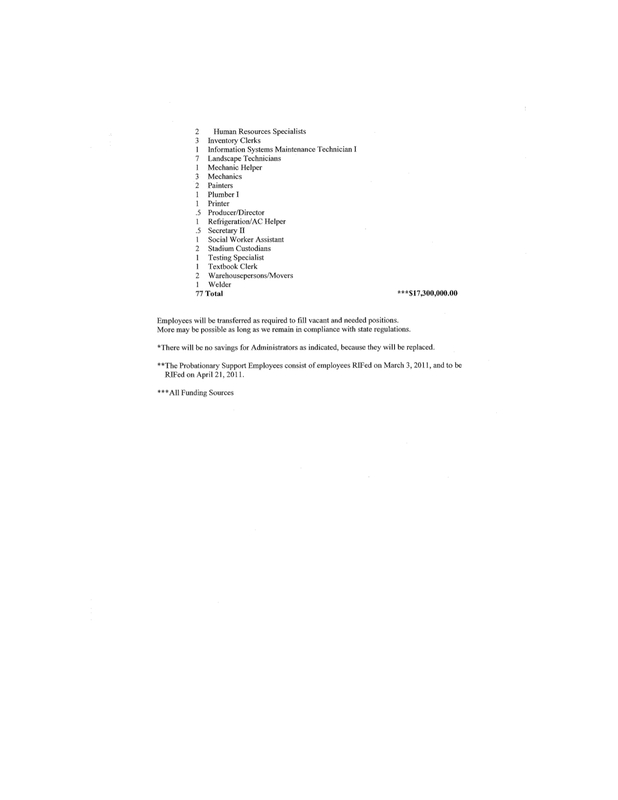 That night, the board also voted to approve the first Reduction in Force of 2011. The first RIF, according to the board of education at that time (Blair, Robinson, McCaulley, Morrison, and Birney) saved $6.9 million immediately and $41.6 million every year after that night. That occurred five months before Dr. Wardynski started on July 5, 2011. The two RIFs, in other words, we expected to save $23 million dollars. 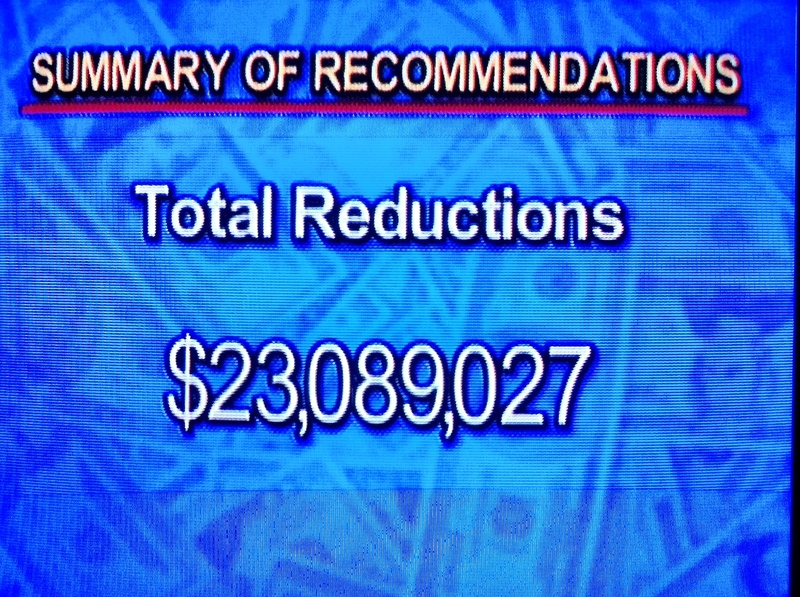 When Dr. Richardson offered his presentation, he claimed that the cuts he had recommended, and that the board approve on April 21, 2011 resulted in $23,089,027 savings this year. Thus, 75 days before Dr. Wardynski was hired on July 5, 2011, Dr. Richardson had made cuts sufficient to cover the $19.5 million deficit the district was facing from 2010. Those cuts were sufficient to put the district $3.5 million in the black. So, as I clearly stated in my presentation, the district was out of debt before Dr. Wardynski was hired. Over the next few years, Dr. Wardynski did increase the budget reserve to obtain the state required minimum of 1 month of operating expenses. So where did that surplus come from? The district cut Special Education by $7 million from FY2011 to FY2012. The state allowed the district to transfer $9 million from the capital fund into the general fund. Revenues from the City of Huntsville have increased by $21,334,157.58 since 2010, while Instructional Services have decreased by $354,553.67. Dr. Wardynski has been extremely successful in running off our most experienced and educated teachers. As I wrote in September 2011, the special education was cut by $7,173,863.74 from the FY2011 budget to the FY2012 budget. You may view the difference in this spreadsheet. I asked repeatedly about the cuts. In May 2012, the seven million was miraculously returned to the budget, but the expenditures were still showing the cut. 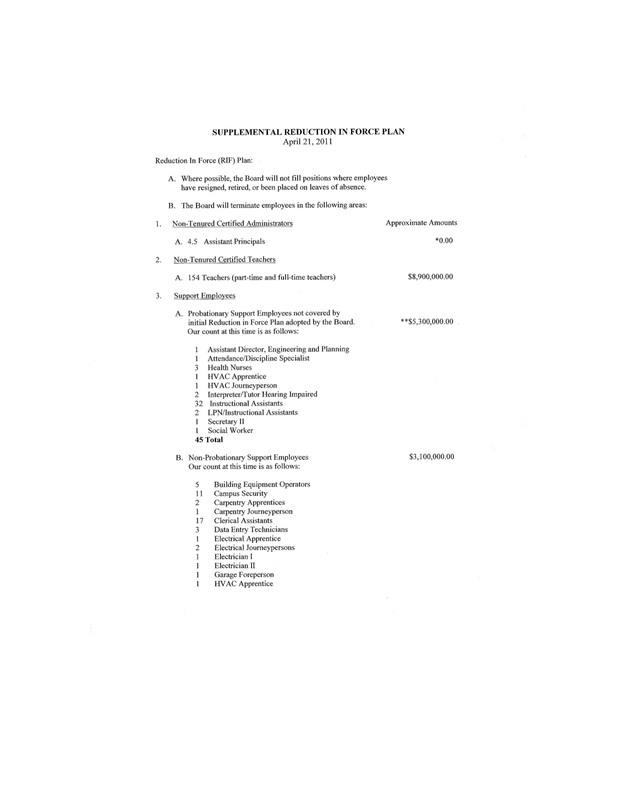 Ultimately in October 2012, the Federal Government agreed that the district had cut Special Education too deeply, and required that district repay $2.6 million. In June 2012, the district was allowed to write off the $9 million in debt from a 2011 transfer from the capital fund into the general fund as The Huntsville Times reported. Thus, $9 million of the surplus resulted from the state allowing the district to write off the debt. Dr. Wardynski has benefitted from an dramatically improved local economy. 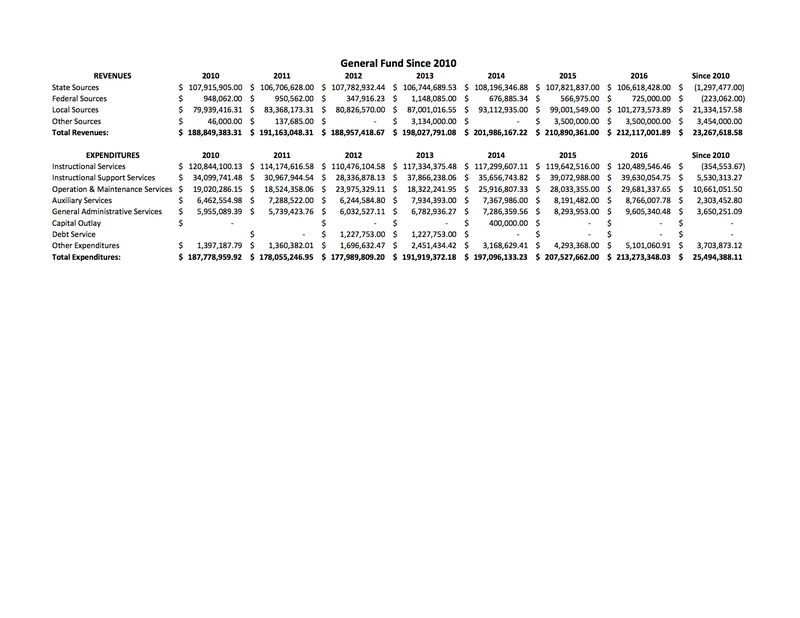 If you compare the budgets from 2010 through 2016, you’ll see that revenues to the district’s general fund have increased from $79,939,416.31 in 2010 to $101,273,573.89 in 2016. This is good as State funding and Federal funding over that period have decreased by $1.5 million. Has Dr. Wardynski been instrumental in improving the economy in Huntsville? If so, he should voice a complaint to Chamber President Chip Cherry to have his impact listed in the 2016 Regional Economic Development Brief that was recently completed. In October 2012, the district employed 218 (13%) teachers with less than three years teaching experience. In June 2016 (the most recently available number), the number of teachers with fewer than three years experience had more than doubled to 466 (27%). In 2012, the district had more teachers with 12-15 years of experience (221) than less than 3 years of experience (218). From 2013 on, the largest single group of teachers had less than three years experience. 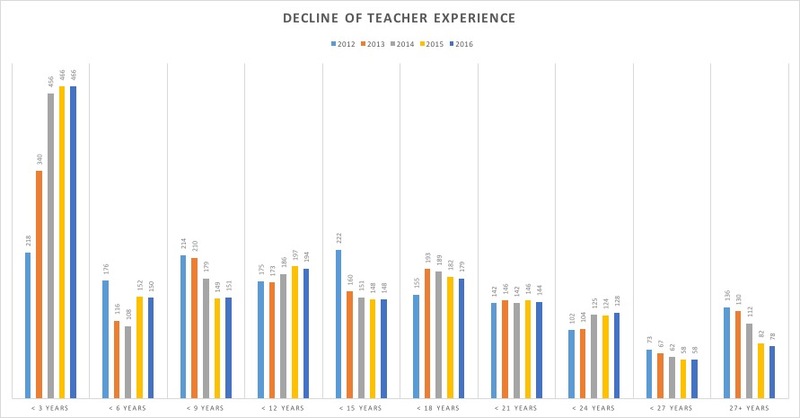 So, does this decline in teacher experience matter? According to a review of thirty research studies published over the past 15 years, Kini and Podolsky of the Learning Policy Institute found that the answer is yes. The experience of the teacher does actually improve student learning. Four years ago, our district was fairly balanced when it came to experienced and non-experienced teachers. There were more teachers with 12-15 years of experience than any other group. Today, non-experienced teachers are three times as plentiful as any other group. This is the “leadership action” that he has to pay Mercer and Associates $30,000 a year to confirm for him. Dr. Wardynski, if you will permit me just one moment, I have a brief piece of advice for you. If you want people to trust you and your claims, do your level best to at least quote people correctly, as I have done for you. Oh, and true leadership has absolutely nothing to do with fear as you have practiced here in Huntsville for the past five years. It does not require threats. It does not require profanity. True leadership starts with trust. If and when you learn this, perhaps some day you will grow into the leader that you spend so much of your time telling everyone that you are. I appreciate this opportunity to have this dialogue with you. If you would like to continue it, I’m more than happy to. Education requires dialogue, after all. If you were an educator, perhaps you would know this. The reason that Wardynski is rewriting history is that he sees his power crumbling. He sees parents coming together in Huntsville United to question him. He sees students standing up to his arbitrary decisions to replace effective coaches. He sees teachers joining together in the Huntsville Education Association to stand up to his personally devised and unfair “ineffective teachers” list that Wardynski admitted under oath that he had developed entirely on his own because, you know, he knows so much about what effective teaching and effective leadership looks like. Prior to coming to HCS Wardynski was the CFO of the Aurora Colorado. He left that school district in debt to the tune of 25 million.